Editor - Website of the open source Sokoban game JSoko. 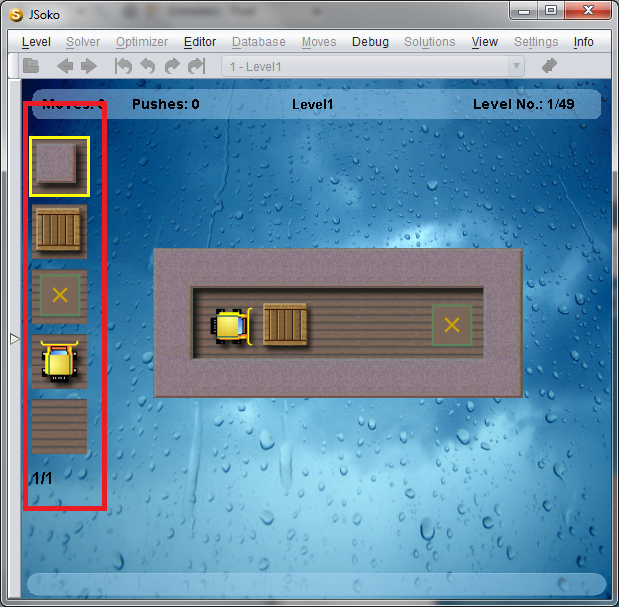 If the editor is opened the elements of a level are shown at the left side of the game view. You can see the level elements in the red rectangle. Click at the element you want to add to the level. You can also use the mouse wheel to scroll through the elements. The yellow quadrat indicates which element is selected. Then click at the position the element is to be added to the level. In the status bar at the bottom of the GUI messages are shown if the level is invalid. Under the level elements two numbers are shown . In this example screen capture it's 1/1. The first number shows the number of boxes in the level, the second shows the number of goals. Note: Only boxes and goals that are in the "active" area of a level are counted. Use the editor menu for cancelling the changes or starting with a complete new level. The editor starts with the level that has been used for playing when it is opened. However, you never change that level but always create a new one. It's possible to save the level or to copy the level to the clipboard via the level menu. You can rotate or flip the level from the transformation menu (View->Transformation). This really changes the level. Hence, all transformations are saved to the level file when the level is saved.